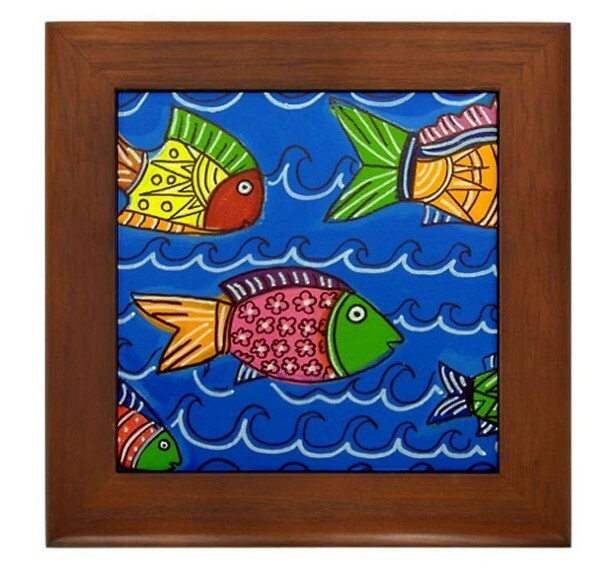 MEXICAN FOLK ART PAINTING- "Tropical Fish" Framed Tile Frame measures 6" x 6" x 0.5", with 4.25" x 4.25" tile Constructed of stained Cherrywood Two holes for wall mounting The artwork is based on my series of Mexican Folk Art paintings. My name is Anggelyka V. Apostle (A.V.Apostle) and I have been painting and exhibiting for over 20 years. My resume includes high profile public art and commercial murals as well. Please allow up to 2 weeks for delivery as this is a custom piece.